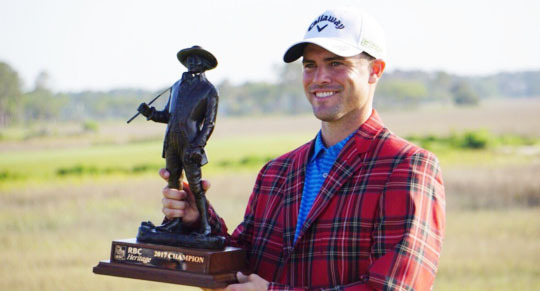 Wesley Bryan became the first Palmetto State native to win the RBC Heritage, Presented by Boeing. 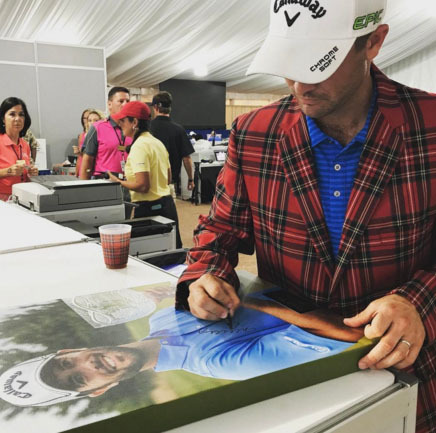 The first tournament was won by Arnold Palmer, but until Sunday no golfer with South Carolina roots had put on the Tartan Jacket as the tournament champion. 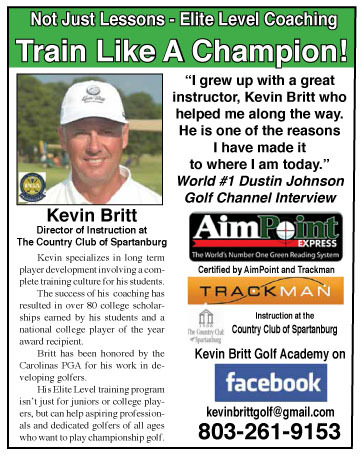 Earlier in the week we talked with Bryan about the success of South Carolina golfers on the PGA Tour and his hopes for the week. 2017 RBC Heritage, presented by Boeing Champion, Wesley Bryan. Q. Wesley, congratulations. What does it mean to win here in South Carolina, Hilton Head Island, for your first PGA Tour victory? WESLEY BRYAN: This is as good as it gets. It’s one that I grew up dreaming on the practice green late at night when I was a kid, like this putt’s to win the Heritage. And to get it done here is one of the coolest experiences ever. Q. Take me through your emotions, now. The putt at 15, the birdie you got there gave you the lead at 13 under. Were you cognizant of where you stood and what was going on? WESLEY BRYAN: Not really. That birdie — I just thought I needed that birdie there to keep up. I didn’t realize that it would give me the lead. And I knew 16 being a short par-4, not an overly tough pin location, I figured I needed one, maybe two coming to the house. And luckily the guys out in front, or that were just behind me didn’t make any birdies. And I was just kind of able to limp in, so to speak. Q. Take us through those nerves on 17 and I guess that situation? WESLEY BRYAN: Yeah, No. 17, shoot, I just hit three of the best shots I’ve hit all day. The tee shot, the wedge shot and the putt on 16 and didn’t make birdie. And at the time I was thinking I needed one, maybe two birdies to go ahead and lock it up. But on No. 17 I just — I was super nervous, but I didn’t really know it. It’s not like I had my hands shaking or I was like getting ahead in my thought process. I just went purple a bit and, yeah. And then I guess I realized I was really nervous. But still on the tee shot I picked my target, I hit it right at it. And I mean it didn’t get as close as I wanted it to, but I definitely had the putt that I was looking to have that I was practicing on the practice round. I mean really coming down the stretch the last four holes I didn’t really miss a shot. And it’s really satisfying to know that under the gun I was able to perform. Bryan started the final round 4-shots off the lead, but made up ground quickly. Q. I know you always believed you could be where you are right now, but is it a little bit surreal to know that a couple of years ago you were winning on SwingThought TOUR, and now three times on the Web.com Tour? 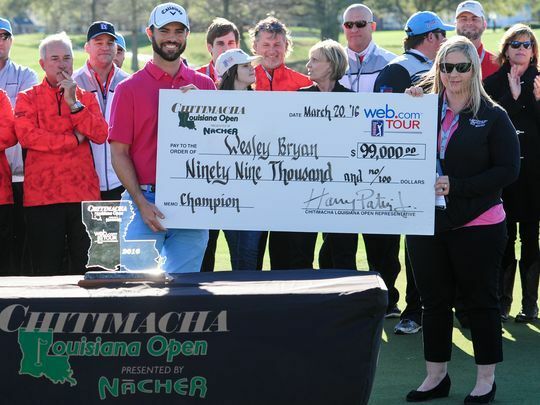 WESLEY BRYAN: I don’t know if I was winning on the SwingThought TOUR. I won a two-day event once. But that was about all the Mini Tour success I had. And last year to win three times on the Web.com Tour was unbelievable. I definitely didn’t foresee that happening when I started the year. And then starting this year I knew that I was good enough to compete out here on this level because I’d gotten in contention a couple of times. And I knew that my game was good enough to win. And just to be able to come out here and show it for four days and the last couple of holes is something you can only dream of honestly. Q. You had a good run early, I think three straight top 7’s, a couple 4’s, what did that do for you and did it help you today? WESLEY BRYAN: Honestly I didn’t know that I had made four birdies in a row until I looked up on the leaderboard and I guess I had gotten to 11-under or maybe 12 at that point, I’m not sure. But one of them was a two-putt and one of them was just kind of a short four footer straight up the hill. And I looked at the leaderboard and saw that I climbed within one. And on No. 8 I hit the worst tee shot you could have imagined. I really hope the Shot Tracer is on it when I go back and watch some of the highlights from it today because it was atrocious. Made honestly a really, really good bogey. And from there it kind of sharpened my focus. I knew I needed to get back to the golf tournament. And I was able to, like I said, hit a lot of really good shots on the back nine. Q. Talk a little bit about being the first player from South Carolina. 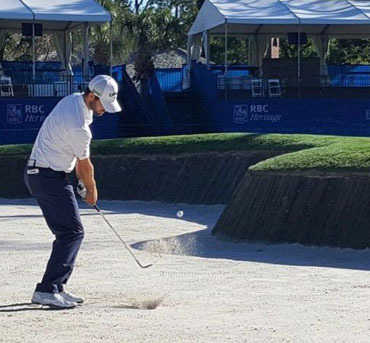 WESLEY BRYAN: Honestly I didn’t realize that until maybe after my first or second practice round one of the SCGA guys came up to me and said no South Carolina guy has ever won here. It’s crazy to think that all of the great golfers that have come out of the state not one of them has won here. But to be the first is really, really special. And like I said, to win in my home state, I honestly couldn’t have dreamed anything better than this. Q. The size of your galleries all week were pretty huge, especially coming down the stretch here. Did that add maybe any extra to the burden, because you didn’t want to let everybody down, or did it help lead you to victory because you could feel such positive energy out there from so many people? WESLEY BRYAN: I wasn’t really worried about letting anybody down, because if it had not gone the way I wanted to, I would have by far been the most disappointed. But having support out there was obviously great. When I hit the bad shots there was always encouragement. Everybody, after I made bogey, hey, you can do it, keep your head up. That’s really cool. And then when you hit a good shot you get a little louder roar than the rest of the guys. So that was really special. To be able to win in front of the home crowd was, like I said, just unbelievable. Bryan didn’t get out of the press tent without signing the first of what will be many autographs. Q. Would you mind giving your thoughts on Harbour Town Golf Links as a course and it’s uniqueness as a course on Tour? WESLEY BRYAN: I mean this is — I’ve said it for a while, that this is one of the best golf courses that we’re going to play all year. A lot of the guys rave about it because you have to work the ball both ways off the tee. You have to work the ball both ways going into the green. You have to miss it in the right spots around the green to have a chance. And it just — it’s one of the only courses on Tour where you’ll see that you have to play every single shot in your bag. And I love it. I’m not a super technical guy, so the guy that kind of imagines shots going both ways. I work the ball probably a little more than the average guy out here. This is a course when I looked at the schedule starting off that this is one of the places I thought that I had the best chance to contend at. And I guess after all the dust settled my intuition was correct. Q. What do you think this means both for you, for your career, and the way you can now manage your schedule with the exemption and things like that, and plus the confidence I’m guessing you’ll now take going forward when you tee it up, wherever you’re going to tee it up next? WESLEY BRYAN: I don’t know if it changes the schedule much more than obviously I know I’ll be in the majors and I know I’ll be in all the tournaments that I want to tee it up in. So that’s really, really nice. But at the end of the day it doesn’t really change anything other than I now have one PGA Tour victory. There’s a lot of guys that just have one PGA Tour victory. And my No. 1 goal is to get No. 2 at this point. Q. What kind of memories do you have from 2004 when your dad played here, you would have been about 13 years old then? Q. But do you remember being here for that and do you remember having any thoughts about one day I’ll play here or anything like that? WESLEY BRYAN: Yeah, I remember a lot from that week. It was really cool to watch my dad tee it up. George, my brother, was caddying for him. So we were — looking back at it, I probably was one of the most annoying kids out here on the property, because I was going up to every single player that I could put a face to a name and harass them and ask them questions. Player dining, just picking the table with the biggest superstar and going and sitting down. Dad, this is where we’re sitting. (Laughter). So I remember a lot from that week. And just being able to tee it up inside the ropes here, after watching my dad play in 2004. He didn’t play as well as he wanted to. To be able to compete in the same event he competed in, I guess 10, 15 years ago or so, was really, really neat. And then obviously to win was just another icing on the cake. 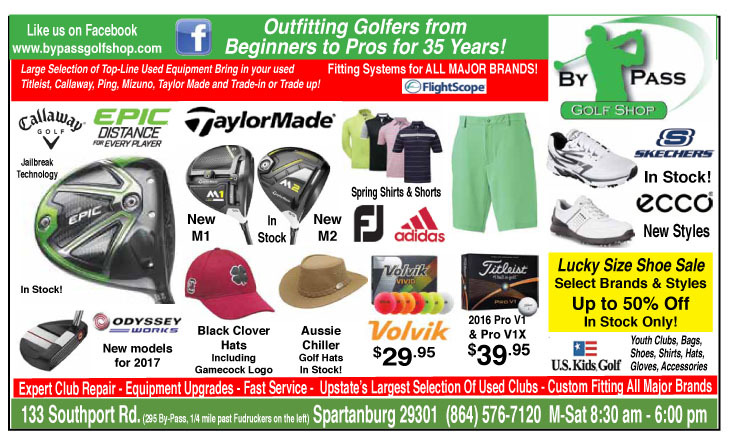 Bryan won three times on the Web.com Tour last year and earned a promotion to the PGA Tour. Q. Can you pinpoint what has happened in the last two years that — you’ve gone from, as you were saying, a mid-level Mini Tour player to a three-time winner, now PGA Tour winner, do you know what’s happened with your game, how it got there? WESLEY BRYAN: Honestly I have no idea. There are times I feel I was way better back in high school than I am now. I think I just manage my emotions a little better now. I feel like I’m a slightly better ball-striker from let’s say 150 to 200 yards, definitely better than I was. But everything else I feel like stayed the same. It’s not like I all of a sudden hit the ball really far or hit the ball really straight. I’ve got no idea what changed. Q. I was talking to Patrick Lunde earlier today, you can tell me if this is true or not, he was telling me that in college you had a rough stretch and he tells me you shot 102 in college? WESLEY BRYAN: 101. Actually I shot 100, but I signed for 101. Actually I just decided to sign it. But I learned my lesson, check every number about. Q. So was there a point for you deciding whether you should continue playing this game and how bad did it get and what changed for you? WESLEY BRYAN: Yeah, that was my junior year. I hit rock bottom in golf, so to speak. But at no point did I ever contemplate giving up the game. I’ve always been one of those guys when things aren’t going the direction I want them to, you have two options, you can either work like crazy or you can just crawl in a hole and hide. And I kind of chose the first of those. I really — adversity is going to strike in the future at some point. Obviously you’re not going to win every week. You’re not going to play great for every week of the year. So just what I learned from there was when adversity hits just to keep at it and keep working, keep working hard and come out better. Q. You live in Augusta. 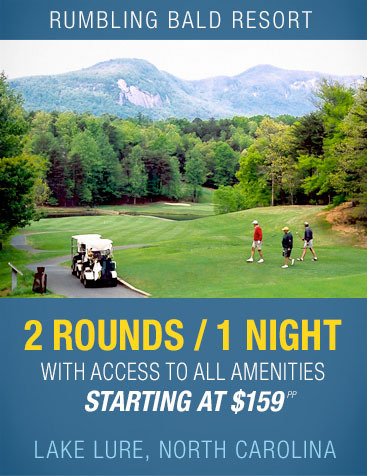 Do you know where you’ll be staying next year for the Masters? WESLEY BRYAN: I’ve got a Master bedroom to keep available for myself. And honestly me and Alex Burke were talking on the ride over here, this is the best case scenario winning this week, now I’ve got 51 weeks to get ready for Augusta in my own city. So that’s like, honestly, a dream come true. Call it my home golf course for the next 51 weeks. Q. How did you handle the pressure out there today? WESLEY BRYAN: Like I said, I mean on the back nine I thought I needed a few, at the very least, just to keep pace. I was a little surprised when I saw the leaders going backwards. And I looked out and Kuch I guess shot 64 today and Martin Kaymer had a low one going. You just figure that somebody from the last three or four groups was going to go out and shoot a number and you had to chase it. But luckily for me that wasn’t the case. And I just kind of hung in there all day and kind of lurked within one or two of the lead and made a couple of birdies on the back nine and nobody else did. And when the dust settled I was on top. And honestly I don’t know how it happened because I was really surprised that nobody birdied — nobody really birdied 15, 16 or 18, given the wind and that pin location was a gettable hole with a shorter mid iron to it. I’m glad it worked out the way it did. Q. When you look back at the week, what were the most important things that helped you win this golf tournament? WESLEY BRYAN: Staying composed. I hit a lot of really, really bad shots out there. Even today I hit some of the worst I’ve hit in a long time. But was able to stay composed. And had a couple good up-and-downs for bogeys this week, which they’re going to be bogeys on the scorecard, but they were kind of the momentum keepers, so to speak. Q. 500 FedExCup points puts you 14th now in the standings. That top-30 go to Atlanta. That’s pretty solid in the season for you. WESLEY BRYAN: Yeah, I’ve got to keep my head down and keep going to work and look up at the end of the year. I mean obviously the No. 1 goal coming into the year was to get to Atlanta. And we’re halfway home. And as long as we keep up the good play we should find ourselves there come — I don’t know what month that is — August, maybe? Q. What were the emotions like coming down the stretch on the back nine? WESLEY BRYAN: I got really nervous. I’m not going to lie. But was able to keep it together and I was hitting quality shots coming down the stretch. And it was things that I was able to do last year that I could draw on experiences knowing under the gun last year I was able to perform. And honestly the only thing different here is the golf course. And was able to kind of draw on that experience and use it to my benefit. Q. Speaking of last year, 15 months ago you had never played in a PGA Tour-sanctioned event. You win three times on the Web.com Tour. Now a win on the PGA Tour. How has this happened so quickly? WESLEY BRYAN: I don’t know. Will Farrell said it best, “Escalated quickly.” Honestly I’ve got no idea. It’s still kind of surreal. Maybe one day I’ll wake up and kind of realize what’s gone on the last, I don’t know, 15 months or so. Q. 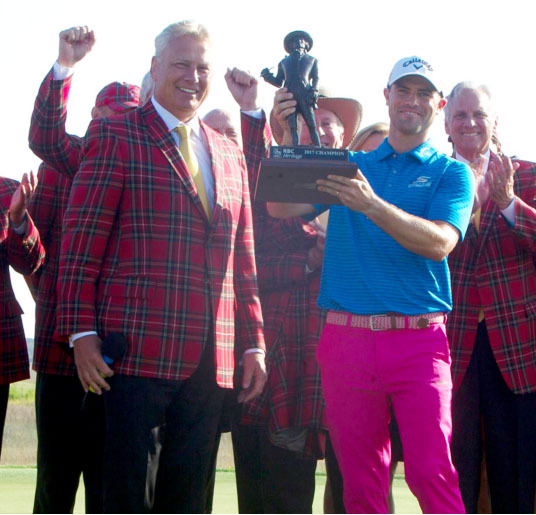 When you put the pink pants on today, you thought this would go good with that tartan jacket? WESLEY BRYAN: Actually, I think it’s going to look terrible. But I’m going to still be cheesing ear to ear. Q. Your first win obviously special. But what does it mean to do it here in the state of South Carolina, a place you’ve called home for at least 22 of your 27 years, to become the first South Carolinian to win the tournament? WESLEY BRYAN: This is special. This is one behind any major I would put up on my list pretty high. To be able to knock it down, especially in front of the home crowd. They were awesome out there today. I got a bunch of cheers when I did stuff. And a bunch of encouragement when I screwed up little bit. But it was really special.